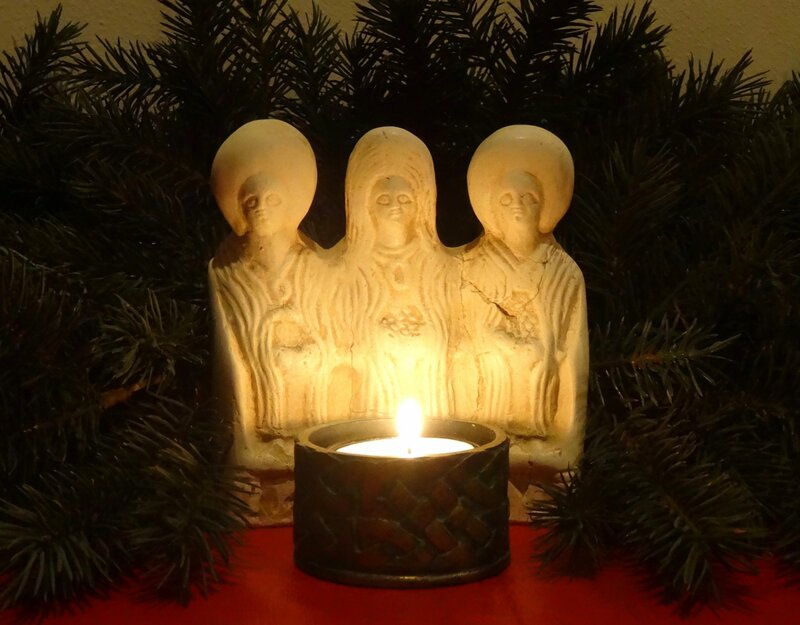 I discovered today that the 20th of December, as well as heralding the festival of Yule and the Winter Solstice is also called Modraniht or Mother’s Night. In old pagan cultures, it was a night to honour mothers and female ancestors and I suppose recognise the turning of the year from the feminine dark towards the masculine light. In the Celtic calendar, the winter solstice is the midpoint of the season of Samhain and the archetype of the Crone is often identified to recognise the coldness of winter, the death of the old. These days, the consumer fest of Christmas with its cozy Holy Family of the Nativity story, its sterilised tale of angels and wise kings seems a world away from the cut and thrust of what would have been a scandalous birth to a poverty stricken young couple who subsequently found themselves to be refugees. I was listening to Alexander Shaia speak with Rob Bell on a podcast and he was discussing how the early church developed the feast of Christ, which only became popular from the 4th century on when Christianity moved further in to the cultures of northern Europe. While many might scoff at the appropriation of pagan festivals for Christian worship, and while it might be disingenuous of me, I rather like to think of the early followers of Jesus sharing their understandings of the world, of the spiritual realms with the people of these other cultures and beliefs and seeing how their different practises resonated with one another. I like to think that in some cases there was a mutual understanding and appreciation of what significance this time of the year held for people who were largely dependent on the sun and who longed for it to return. My children’s school held a nativity service this week in a local Presbyterian church and I was really touched by the effort that went into it. It’s no mean feat to get 180 children to pull off a play with singing and costumes and nervous narrators, but they did a terrific job. The theme through out was that Christmas was all about love, the incarnation of Love in human form, Light piercing the darkness. The story of the birth of Christ into the world is the story of hope and light and love at a time of the year when we could all do with the return of the sun. The whole unveiling of years of misogynistic abuse of women by men in power has had me on the cusp of a simmering rage lately. The TIME magazine picture of the silence breakers, with the evocative elbow of a woman who still needed to protect her anonymity, was a powerful hint that something fundamental is shifting. I’ve been speaking lately with friends going through the horror of messy and protracted separations with men who seem to have lost all sense of responsibility and decency. I’ve had conversations with other women about the issue of the ‘mental load’ at this time of year, the pressure to have everything sorted and organised for Christmas, running ourselves ragged so that everyone else has a wonderful holiday. I’ve listened to debates about working women and the continuing struggle for affordable childcare. For all the talk of equality and opportunity, many more women of my generation are realising that when we were told that we could have it all, when we were encouraged into education and careers, it was still assumed that, when it came to having children, we’d be the ones expected to compromise. Violence against women, exploitation and inequality in the workplace, the sexualisation of young girls, the demand for perfection so that we can still be consumed, the continued legislation of our bodies…. I’m looking toward 2018 and thinking, this cannot go on. Everything must change. The Winter Solstice begins the festival of yule, the 12 days of Christmas and the honouring of the Goddess in ancient cultures. How fitting then that at the centre of the Christian story is a young woman whose song of liberation is rung out year after year. A young woman of questionable status, giving birth to a child without her womenfolk nearby, witnessed only by those lived on the margins of society. A woman who consciously allows love to become incarnate through her so that the hope of liberation from oppression can become the light we cling to. This is the song she sang and this is the hope she instilled in her boy, that the God she believed in would not look away from those who are ignored, oppressed, downtrodden. That this new way of being human that he would grow to model, when the Spirit and the Body are beautifully united as they always should have been, could become a powerful, transformative movement that would speak up for the voiceless and show what real love truly looks like. I know the church doesn’t look like this a lot of the time. I’m in the heart of my own struggle to give expression to a faith that has been hijacked by power hungry, woman hating men. But Christmas is the time to focus on the hope that one day, it could be beautiful. So in honour of Modraniht, Mother’s Night, and thinking of all the women, with or without children, who are longing for liberation, I give you Mary’s Song. Not many people will have heard of Kristen Bell and she probably prefers it that way. Her husband, on the other hand, is a renowned and sometimes controversial figure in the American Christian subculture. 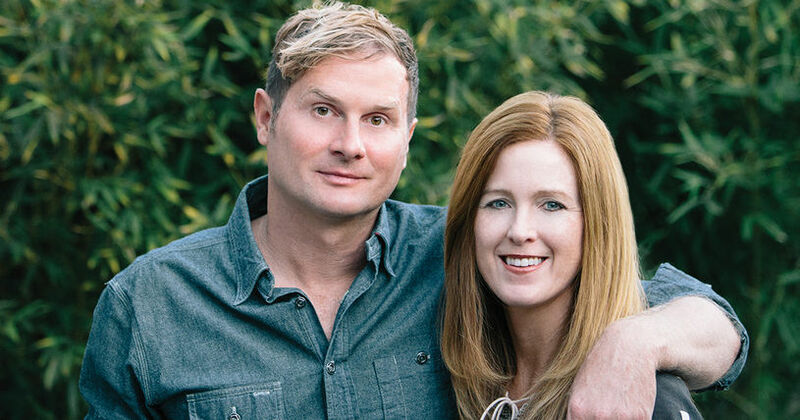 He was once a mega church pastor but he left that role, moved to California and is now an inspirational speaker who’s contemporaries and colleagues include Oprah Winfrey and Deepak Chopra. He’s a writer and a podcaster and I’m not ashamed to say that I respect and admire him very much. I’ll admit, I’m a bit of a fangirl. But I’m not just a fan of him. I’m a total fangirl of his wife. Kristen has been on the journey with him the whole way and their joint publication on marriage The Zim Zum of Love is as much her work as his. (I actually recommend the audio version of the book because it’s the two of them talking and they are so amazing to listen to.) While he is clearly the ‘front man’ of their band, she’s as much an equal part in all the work that he puts out and the man is nothing if not prolific. I listen to Rob’s weekly podcast and look forward to it but I get very excited when Kristen joins him because I know I’m going to get some very powerful inspiration because when they talk together, and I think often they forget the mic is recording, their ZimZum is on fire! I took them with me on my walk this morning, because Rob has just released his first novel as a hardback edition and Kristen was to interview him. Their beautifully intimate conversation, while it did have the new book as a starting point, meandered into the reality of burn out, the necessity of rhythm in life, the beauty of Sabbath and the discovery of enough in the every day. I’ve been wrestling recently with how to manage all the things I want to do at the moment with the reality that my physical energy is pretty low. One of my driving motivations is the need to be productive and, although I’ve written in recent weeks about dropping the ball and letting winter be a breathing space, I’ve fought the urge to go into the quiet. It’s a major case of FOMO! What if I switch of social media and miss out on something? What if I decrease my output on the blog? What if I lose traction, momentum or followers? But listening to Rob and Kristen muse on the difference having a rhythm and incorporating proper rest into their lives, really felt like the affirmation that my body is speaking wisdom and I need to slow. the hell. down. It’s the first of December. Advent begins on Sunday, when we Christians focus on the hope that one day all things will be made new even as we live in the muck and mire of life. Christmas is the reminder that there is light to be found in the ordinary, sacredness in the mundane. Advent is the reminder that the end of the story is that love wins. We live in the tension of the now and the not yet. In that space, we can choose to do small things that show a different way of being human – a life of joy, peace, hope and love. So thank you Kristen (and Rob) Bell for your transparency and your positive leadership at this frantic time of year and for showing the way to a more wholesome way of being human in the world.